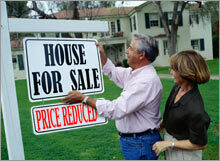 Median price sinks 3.5 percent from a year earlier, trade group see more price declines ahead. NEW YORK (CNNMoney.com) -- The price of existing homes sold in October fell for the third straight month and posted the biggest drop on record, an industry group said Tuesday, adding it expects weakness in pricing to drag on into next year. The weakness in home prices isn't likely to go away soon, according to Realtors spokesman Walter Molony. "We do expect we'll see prices stay below year-ago levels through the end of this year, and pick up in the first quarter of 2007," he said. Pat Vredevoogd Combs, a Grand Rapids, Mich., Realtor and president of the trade group, said in a statement the the market has become a good one for buyers. "With the exception of parts of the West, sellers are cutting their price enough to encourage sales," she said. A sharp drop in sales and prices in once hot markets such as Washington D.C. and parts of Florida, coupled with improved sales in some lower-price markets in Texas, have driven median prices down 7 percent in the South. But all four regions of the country posted a year-over-year decline in median prices. "A fourth of the nation - areas that had the biggest boom - is in a correction that will take longer to balance," she added. The drop in prices represents a stunningly quick change in the market. The record high median home price of $230,000 was reached just last summer, in July. A year ago, existing home sale prices were 16.8 percent above the October 2004 levels, marking the fourth-biggest year-over-year increase in prices the group had ever recorded. "Certainly the astronomical price appreciation seen over the last few years is a thing of the past," said Wachovia economist Phillip Neuhart. "Much of the decline in median prices over the last few months can be attributed to the changing mix of homes sold as cautious buyers, seeing a weakening housing market, are less likely to buy up into a more expensive home." Still, the strong price gains of a year ago have left most buyers who have been in their homes more than a year with a more valuable home, even with the recent declines in prices. Condo prices have been in a steeper and more prolonged decline. They fell 5.3 percent in October from a year eralier, the fifth straight decline on that basis. A big chunk of the nation's condos are in markets that were once red hot but have now cooled significantly. The median condo price is now down 7.5 percent from the high reached in June 2005. Neuhart said he was is encouraged that the number of homes sold last month ticked up slightly from September, rising to an annual rate of 6.24 million from 6.21 million. It was the first month-over-month increase since February, and it topped the forecast of a 6.14 million sales pace forecast by economists surveyed by Briefing.com. But Neuhart said a one-month gain is not enough to project the beginning of a turnaround in the pace of sales. The trade group also characterized the increase as a sign that the overall real estate market is at least stabilizing. "The present level of home sales demonstrates some confidence in the market, but sales are lower than sustainable due to psychological factors," said David Lereah, chief economist for the Realtors. "The demographics of our growing population, historically low and declining mortgage interest rates, and healthy job creation mean the wherewithal is there to buy homes in most of the country, but many buyers remain on the sidelines. After a period of price adjustment, we'll see more confidence in the market and a lift to home sales should be apparent in the first quarter of 2007." Still the October sales pace is down 11.5 percent from a year earlier. And the slower sales has led to the glut of homes on the market, with supply rising once again to a record 3.9 million existing homes for sale, up 1.9 percent from September, and 34.4 percent from a year earlier. The huge increases in home prices a year ago sparked the building spree that flooded the market with new homes and helped lead to the current downturn, despite relatively low mortgage rates and low unemployment, two conditions that normally support further price appreciation. Not only did builders build a record number of homes last year, but many were bought by investors who were looking to turn a profit on the purchase, rather than live in the home. Many of those buyers are now looking to sell the homes. The existing home sales report comes the day before the government reading on new home sales, which showed a 9.7 percent year-over-year drop in median new home prices in the September report. Major builders, including Pulte Home (Charts), Centex (Charts), D.R. Horton (Charts), Lennar (Charts), KB Home (Charts) and Toll Brothers (Charts) have all seen sales and earnings fall in the face of the housing slowdown, with many warning the sector has yet to find a bottom.